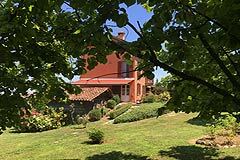 Luxury home for sale in Piemonte Italy Asti Near Nizza Monferrato, Asti, Alba and Acqui Terme (ref: 8032)- Prestigious country house in a tranquil position with the most stunning views... Piedmont Properties in Piemonte. Property for sale Langhe and Piemonte. Map for Property ref: 8032, Luxury home for sale in Piemonte Italy - Prestigious country house in a tranquil position with the most stunning views..